Today’s drafting careers are in demand and within your reach through GIFT! Since all manufactured items and construction projects must be designed and drawn before production, the need for trained design and drafting personnel increases as the economy grows. Our Computer Assisted Design and Drafting (CADD) program prepares students to succeed as CADD technicians in construction, engineering, manufacturing, and civil drafting. What do CADD Graduates Do? CADD technicians specialize in 3D design concepts and modeling, residential and commercial architectural design and planning, and cartography. CADD operators design original (and convert existing) ideas and sketches into workable plans that engineers, architects, and designers use to make machinery, structures, and products. A two-credit course introducing drafting and the tools of the trade to students that includes drafting techniques, lettering, geometric construction, viewpoints, and perception. Two to three credits of hands-on experience using AutoCAD software. Two to three credits that cover the techniques used to design and draft floor plans, exterior facades, and structural components of residential architecture. Course includes instruction on incorporating international building code, ADA requirements, and local building and zoning codes into a full set of house plans. Explore the functionality of AutoCAD in this two to three credit course. Learn about system customization and menu development, advanced drawing techniques, modeling, and drafting applications. A two-credit introduction to the concepts and tools used in Fab Lab environments including safety procedures, machine setup and operation, and costs associated with fabricated items. This two to three credit course uses CADD in commercial applications to produce floor plans, site plans, and elevations. Class emphasizes merging building code with customer needs/expectations. A comprehensive study regarding safety practice and procedure in shop environments which includes tool safety, proper handling of hazardous material, first aid, fire prevention, personal protective equipment, and documentation in this one-credit course. Three credits covering the study of mechanical drafting, assembly drawings, threads and fasteners detail, and basic dimensioning. Students use tools such as SolidWorks, Autodesk Inventor, and 3D printers. In this two-to-three-credit class, covering the basic elements of structural drafting, students learn the symbols, dimension, design, and detail drawings of steel and concrete structures. Class meets daily from 7:30 to 8:59 a.m.
Transportation - please check with your local high school counselor's office. Students enrolled in the CADD program through EAC may work towards their Associates of Applied Science degree. This degree requires a total of 43 CADD curriculum credits plus general education requirements and a GPA of 2.0 or higher. 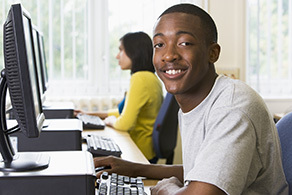 Students may earn their level 1 certificate by successfully completing 17 CADD curriculum credits and demonstrating mastery on both the EAC writing and math placement tests. Students may earn their level 2 certification by successfully completing 30 CADD curriculum credits.